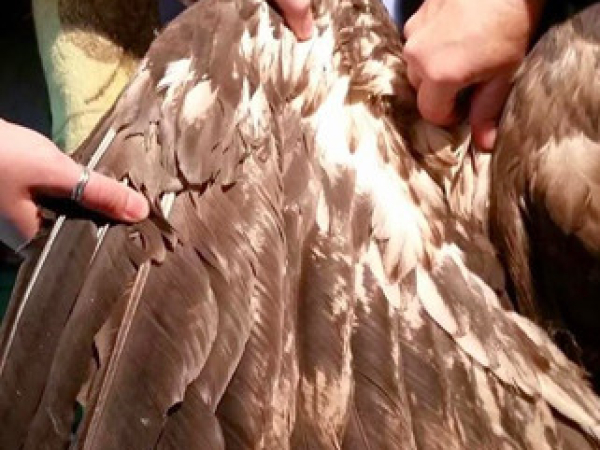 Bob Anderson of Raptor Resource Project was at the Decorah Trout Hatchery on the 22nd and received word that an eaglet was downed in the trout stream nearby. Bob waded through the stream and was able to rescue the eaglet and determined it had a broken right wing. 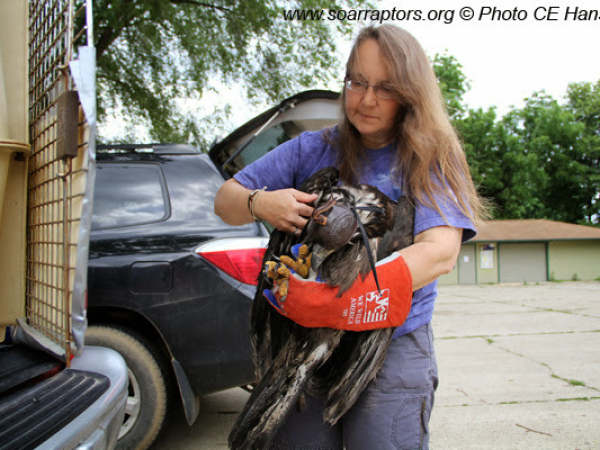 A SOAR volunteer transporter just happened to be in Decorah and brought the eaglet back to central Iowa to meet up with Kay. At the time of rescue, all were confident it was one of the eaglets from the Decorah cam nest, but unsure which one! Thanks to Bob and the other rescuer and to Cynthia for the transport. You’ve heard the saying, “It takes a village…” haven’t you? 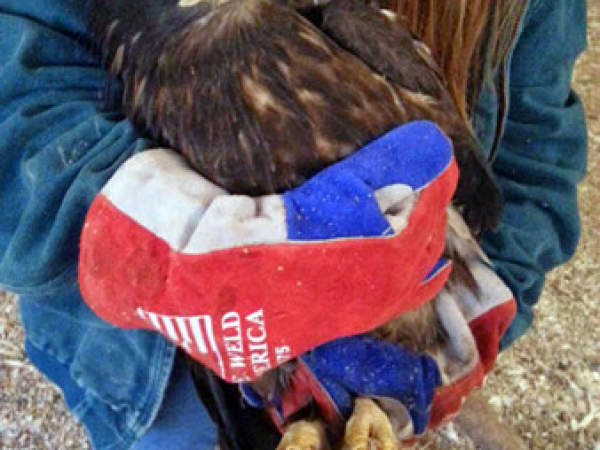 There have been several volunteers involved in the rescue, transport, and care of this eagle. There is also a village of supporters, locally and in cyberspace (i.e. some we know by name and sight and others we do not yet know), that care deeply about this eaglet. We thank each and every one of you! 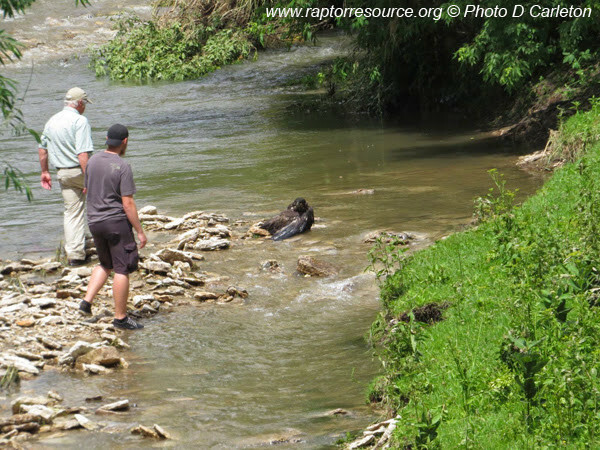 Bob Anderson, RRP, and volunteer wade to get eaglet from rocks in stream below N1 on 22 June 2014. How did it get there? We don't know. 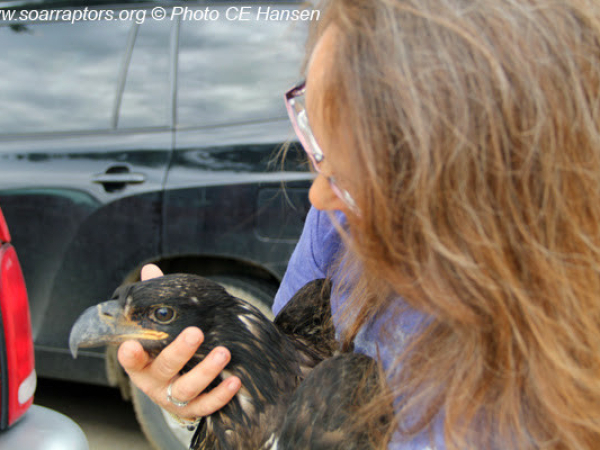 A SOAR volunteer just happened to be in Decorah when Bob rescued this eaglet and she transported and met up with Kay. Every new patient Kay receives gets a quick field exam. The field exam continues before loading into the transport crate in Kay's vehicle. Thanks to Terrie for identifying where the break in this eaglets wing is -- right humerus -- eaglet is laying on it's back. X-ray taken 28 June 2014. This x-ray was taken by Dr. Dirks immediately before surgery on 28 June 2014. Surgery is over... whew! 28 June 2014. 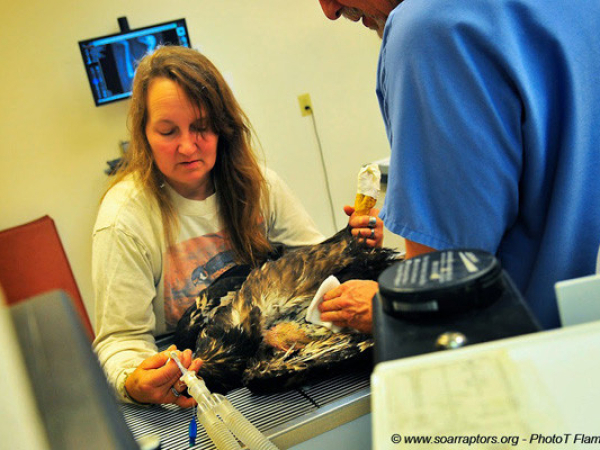 The breathing tube has been removed, the eaglet is waking up, and Dr. Dirks removes the protective athletic tape from the talons 28 June 2014. 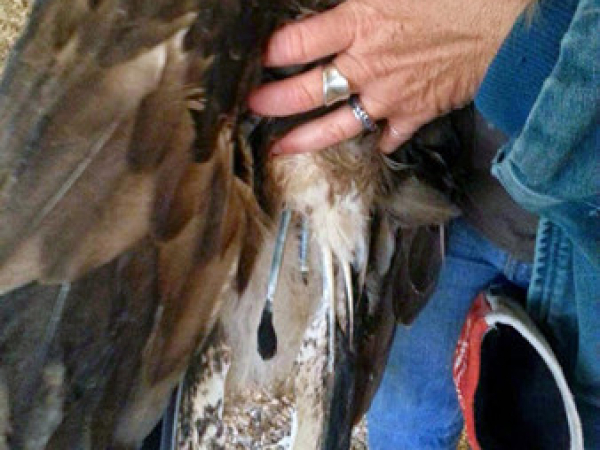 2 July 2014 picture of the Decorah juvenile (admitted 22 June) with wing wrapped after the pin surgery on 28 June. A follow-up x-ray taken 15 July 2014 shows good bone healing. 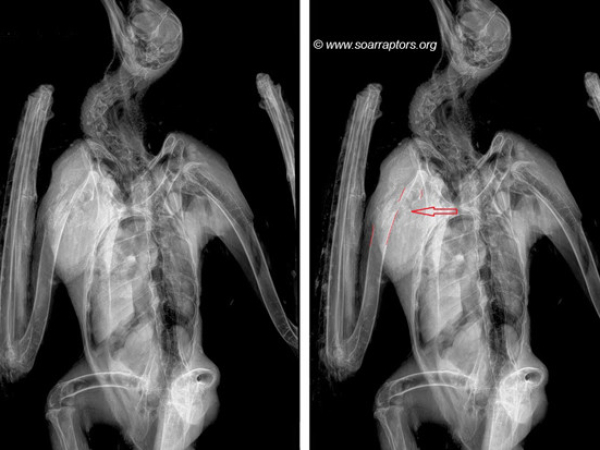 Here is a comparison of the x-rays taken on 28 June and then on 15 July 2014. 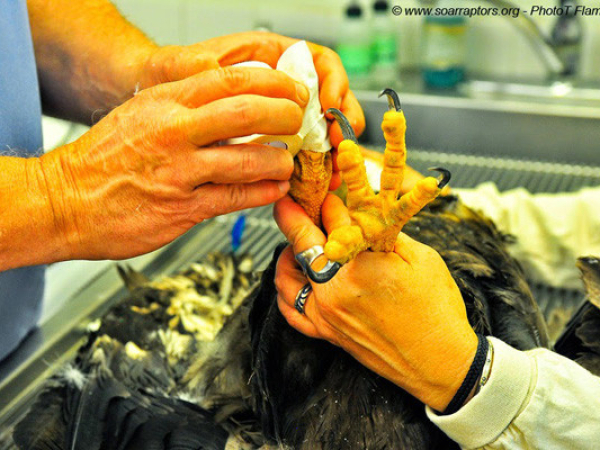 Getting ready for some anesthesia to surgically remove the pin from the eaglets right humerus on 15 July 2014. 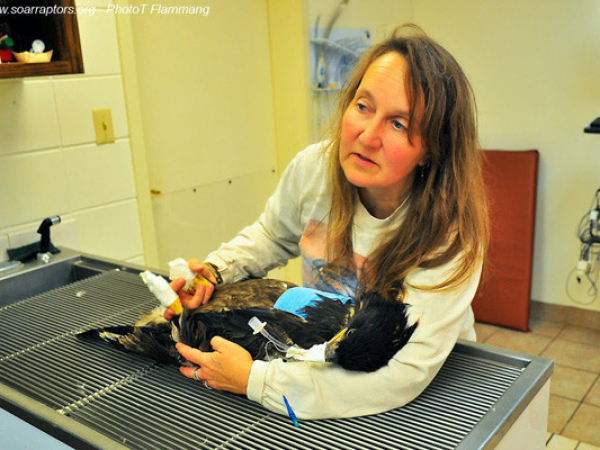 The 22 June admit Decorah juvenile eagle hangs out in an ICU room with the 1 July 2014 admit Boonesfork juvenile eagle. Kay is pointing to new tail feathers growing! 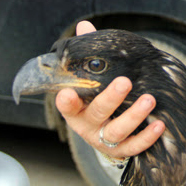 Kay holds the 2014 Decorah juvenile and feels the shoulder joint with her thumb while Savanna gently stretches the wing out. Today was moving day for Decorah to the 20x20 back room. He does have a bow perch to practice on, but for now is preferring a stump. Kay reports he's fat! Goodness, his tail does look different. The new feathers are really for a second year eagle on a first year eagle's body. 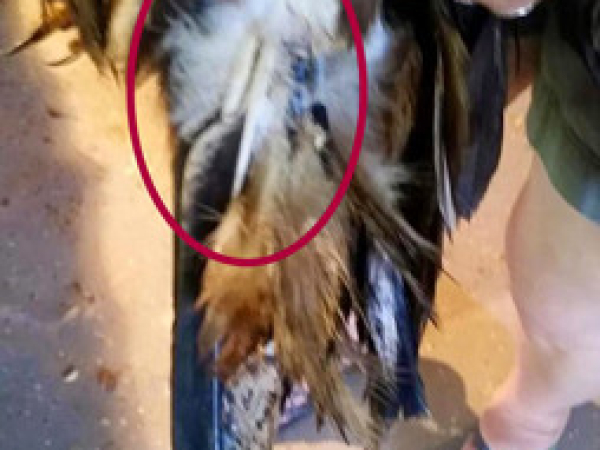 There are two feathers in completely on the right side and two or three new ones growing still in the protective sheath. Transfer to USFWS eagle exhibition permit has been received and training will begin for 'Decorah' to be an education ambassador. No more updates on his status will be done on this page. 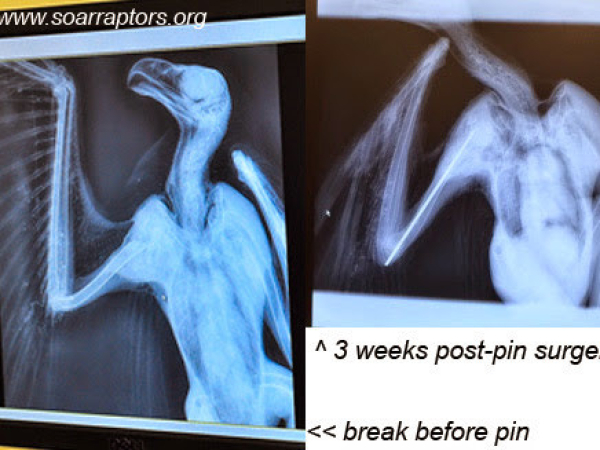 Remember, because of how this humerus fracture healed and where the necessary calcified lump formed, this juvenile only has about 25% use of his right wing, he cannot move that wing. His best option remains being transferred to an eagle education permit. When the Iowa weather turned cold, the education osprey needed to move into his winter quarters (the 20x20 heated ICU room) and this juvenile was moved into an ICU crate and was placed across from another eagle patient (Spencer - also a juvenile - admitted 11/5/14) to be a model eater! The Decorah juvenile eats well when by himself. When it was time for Spencer to move out of ICU, the Decorah juvenile moved, too, both to the 20x20 back room. Spencer bullied Decorah and wouldn't let him have food. It is very stressful to be bullied. 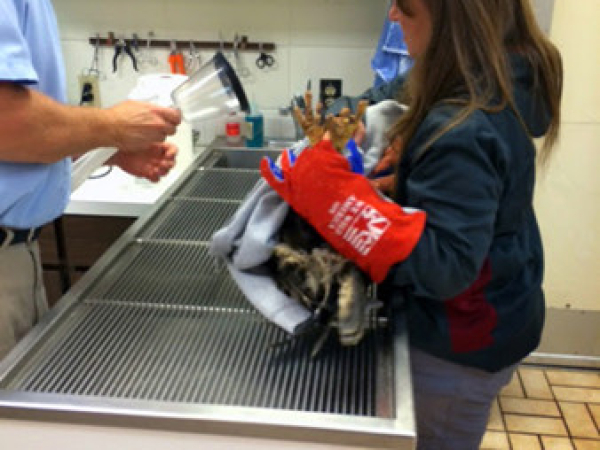 Decorah was removed from that room and put back in an ICU crate, temporarily. SOAR's 15 years of experience in working with eagles has taught us much. A juvenile male eagle is the lowest eagle on the social ladder and a juvenile male eagle that had never flown free before admit is even lower. With an eagle that is not very dominate, like Decorah is now, it is difficult to put him with another eagle and know that he (Decorah) is getting enough food. For now, his best housing option is in the snowy owl's summer quarters. This room can be heated, as needed, to keep food and water from freezing. The Decorah juvenile will not have competition for his food and his stress level will diminish. So why did Decorah and Boone Forks get along so well? They were both admitted as nestlings. As they grow into the next stages of life, attitudes change and juvenile eagles become less tolerant of other juveniles and start to establish pecking order and dominance. Today was moving day for Decorah! During the move, the status of tail feathers was checked out and his tail is coming back in slowly. He has two new grown-in feathers... that look like what a second year eagle would have! He also has two or three feathers peeking through... still with the protective covering. While a weight wasn't taken... he's fat! As soon as the 20x20 ICU room is available, Decorah will be moved there. Being in this room will allow for photos to be taken of this non-releasable eagle without disturbing other rehabilitating eagles and will allow more interaction with Kay in preparation for "ambassador" training. With Boone Forks making full length flights in the flight pen and Decorah still not wanting to stretch out his wing fully, it was time for Decorah to have another visit with Dr. Dirks. An exam and another x-ray told us that the bone had finished healing with a nice calcified lump. Without the calcification we would not have a stable bone, but it is impeding his shoulder joint. Decorah did not have a lucky break, in the middle of the bone a calcified lump is no big deal, too close to a joint it means you will not fly. Every joint needs to work perfectly for wings to get you into the air. People can get by with a stiff shoulder, they can always learn to hold the fork with their other hand. Birds need fully functioning joints to survive in the wild. We hope to add the Decorah juvenile to our USFWS and Iowa DNR education permits and will get that application process started soon. Upon further reflection, the possible trip to see Dr. Dirks was not made. 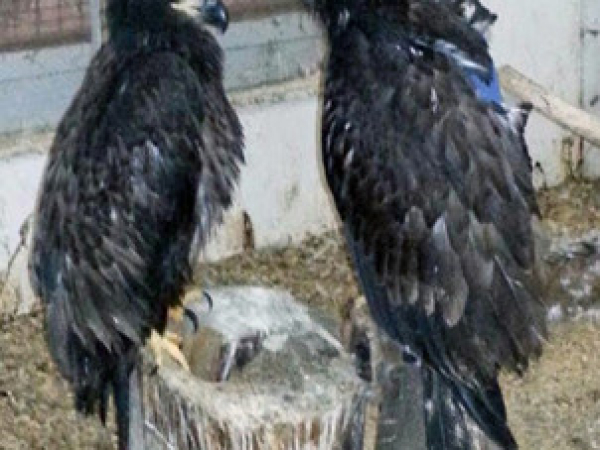 The Decorah juvenile and Boone Forks were both moved to the eagle flight pen. With hands-on physical therapy, the joints in the right wing all move, but he doesn't yet want to move that wing on his own. This juvenile needs time to work things out, if they can be. At last check on the 17th, both were perched on the sawhorse perch they used in ICU. He has not been moved to the flight pen yet as the shoulder joint is still quite stiff. It's much less stressful on the eagle to catch him when he's in a small space. Physical therapy continues and a visit is being scheduled next week for a consult with Dr. Dirks. Remember this juvenile had a very bad fracture of the humerus close to the shoulder joint. The calcified lump that forms around a mended fracture could likely impact the function of that shoulder. The other issue that may be in play here is that a larger nerve runs near the shoulder and that nerve could have been damaged in the accident. Most joints in this juvie's wing seem to work and function, but the wing is still stiff. He will be receiving physical therapy to loosen up that wing. The maggot infestation was near the base of tail feathers where the oil gland is... happy to report that the wound there is healing and fuzzy feathers are coming back in. However, no tail feathers yet. He will stay in his small ICU room with the 7/1 eaglet for a bit longer. Wormed and weighed today -- his weight is up to 8.5 lbs. Kay told folks gathered for the 'After the Fledge' party in Decorah that this juvenile and the Boone Forks juvenile are still together and acting like siblings! His wrap should come off this coming week. 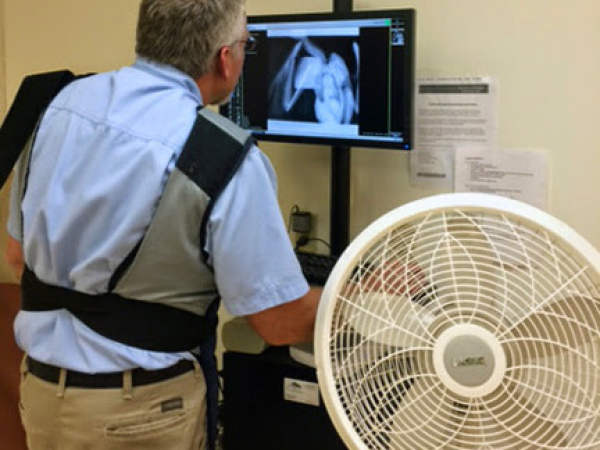 A visit to Dr. Dirks for an x-ray today to check healing progress of humerus bone. X-ray showed good progress and the pin was surgically removed. The wing will continue to be wrapped for at least one more week. This juvenile is being a good patient! He is taking his medicine and eating well. Last night he ate most of a whole chicken and he cast a pellet! Last night juvenile eagle ate a whole chicken leg all by himself. The eaglet still is not interested in eating on his own. Hand feeding continues... which is not a bad thing because he's also getting a mild antibiotic, always good to know the piece of meat you've hidden the anti-b in has "gone down the hatch." Antibiotics will be given for 14 days from surgery, at minimum. An x-ray recheck will be done in 2-3 weeks. 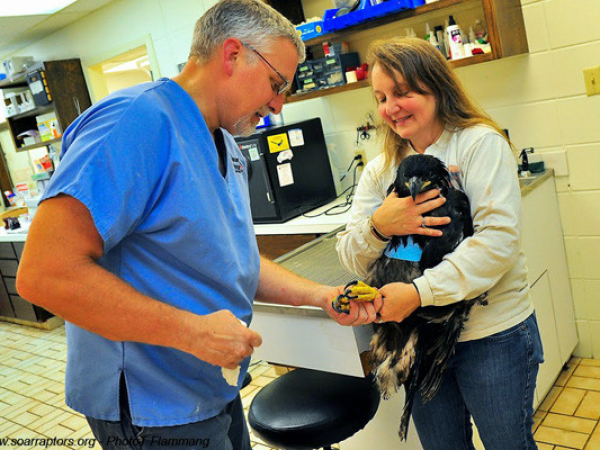 Kay will be taking the eaglet to see Dr. Dirks today for evaluation for surgery. Decision on surgery will be made on the spot. Weight is up to 8 lbs, so the eaglet gained 0.25 pound in about one week. Surgery was done and Dr. Dirks pinned the humerus and re-wrapped with wing. The wing will stay immobilized for at least three weeks before another exam to determine if enough healing has occurred to remove the pin. Surgery has been postponed until June 27th or 28th to give the eaglet more time to strengthen up. 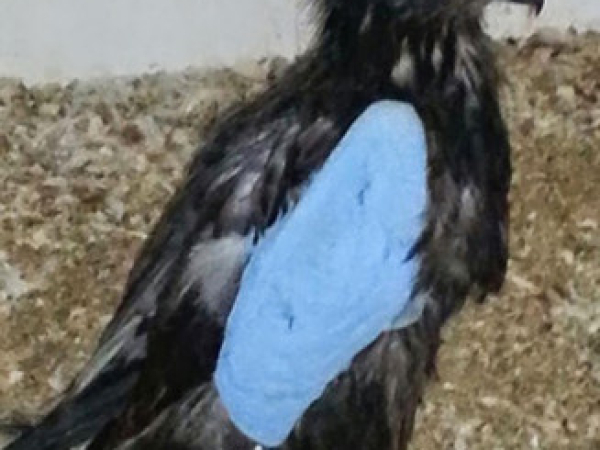 His wing is wrapped and he is currently being treated with a strong antibiotic. An inspection of the eaglet's tail revealed a maggot infestation, most likely from a wound, which we treated with permethrin per Dr. Dirk's instruction. Permethrin is also used to help kill hippoboscid fly and mite and lice infestations. Used properly, it's a safe and effective product that degrades quickly. We hand-fed him venison yesterday and he pooped well an hour afterwards. While we don't usually cheer at the site of poop, this was wonderful to see! If you've had children, small pets, or livestock, you know what good poop (mutes) is and what not-so-good poop is! X-ray taken today and shows there is an oblique fracture to the right humerus close to the shoulder joint. Breaks in the humerus close to the shoulder joint are difficult to heal and surgery is tentatively planned for the 25th. In between, plenty of fluids and food will be offered, along with an anti-fungal / anti-bacterial medication (metronidazole) to help clean up any infections in the gut. The juvenile eagle is resting with with the right wing wrapped. Eaglet was given high calorie fluids and weighs in at 7.75 pounds. Kay believes that she feels a humerus fracture very close to the shoulder joint. 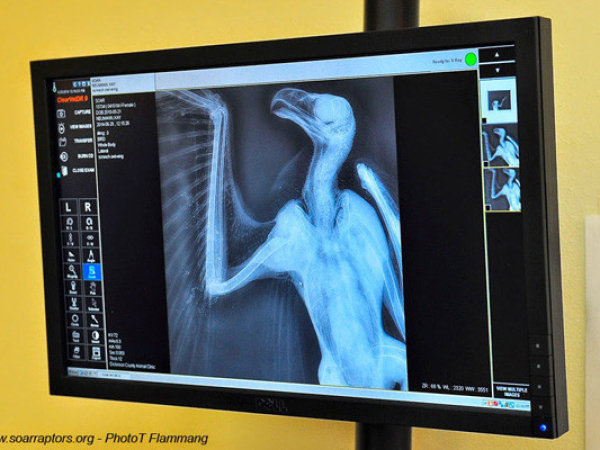 We'll transport the eaglet for an x-ray tomorrow. The good news is that the fracture is not compound (where the bone breaks the skin). MANY bloodsucking insect bites around both eyes.